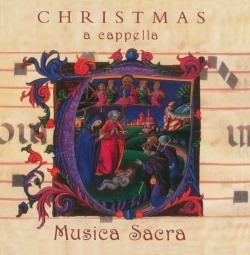 In two discs, recoded six years apart, the Musica Sacra of New Zealand bring us a wide range of Christmas music, covering most of the well-known and much-loved carols, as well as a few less well-known works. It is interesting to note the great leaps in development made between the two issues, both in terms of the presentation and production quality of the disc, and in the abilities of the choir. Disc one (recorded in 2001) is admittedly a little ropey – the sopranos strain at the top of their range, soloists are really rather wobbly – for instance in Once in Royal David City – the voice is not in control but the choir roll their Rs nicely though. It is all a little laboured – the choir don’t sound at all happy or joyful about the fact that Tomorrow shall be my dancing day. 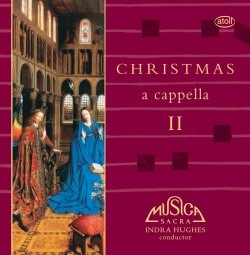 The booklet of Disc one completely lacks a biography of the choir, although the conductor Indra Hughes is present – along with the unusual titbit of information included that he was “controversially made redundant” by (presumably Auckland) Cathedral; sounds to me like an axe to grind and the use of any public arena in which to do so. We also find in the first booklet notes that are rather brief and not particularly informative and design that is clunky and lacking in refinement. By Disc two, the choir are much better. Conductor Indra Hughes has clearly been putting his freed-up spare time by licking them into shape. Their enunciation is better and clearer. They sound more perky and energetic, although the sopranos are little on the flat side. Solo singers are still slightly wobbly, however – in the Wexford Carol the soloist again has issues of control, although the intonation this time isn’t bad. The recorded sound quality is also clearer and more immediate, although the disc was recorded in the same venue of St Michael’s Church, Remuera, Auckland, New Zealand: one track in 2005; the rest in 2007. The printing and design of the booklet looks better as well - these elements are still not fabulous - although I actually thought that the booklet cover was more attractive and better from a design point of view on the first disc. The notes, alas, are equally brief and the opening paragraph is an exact repetition of that printed in the first disc’s booklet. The choir here have a biography, albeit a very short one. Between them - and with the odd repetition - the two discs cover a large repertoire of Christmas carols from all around the world, with a commendable variety of styles, moods and periods. Occasionally a hint of New Zealand accent comes through in the singing – not that that necessarily detracts. * commissioned by Musica Sacra. First recording.